care of when you weave in the yarn tail. You can make many different sizes depending on the hook size you use. 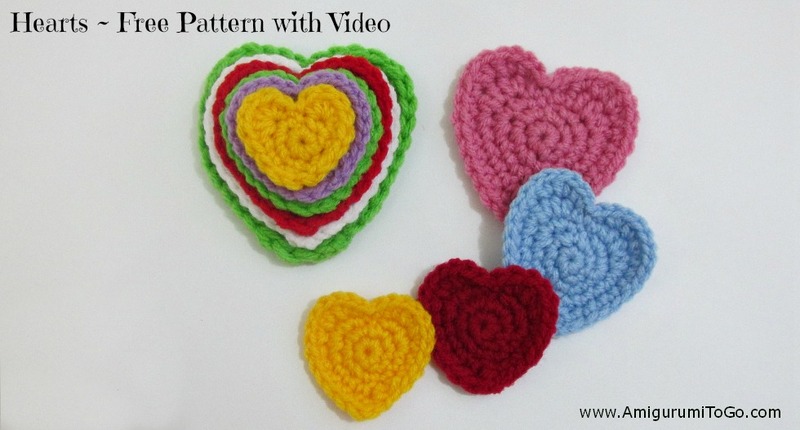 You can also double up on the yarn strands to make them even bigger and also sew them together to get a 3-D heart. It's a fun pattern and I hope you enjoy it! Special notes: Rows 4 and 5 contain a stitch that I'm not sure what to call. 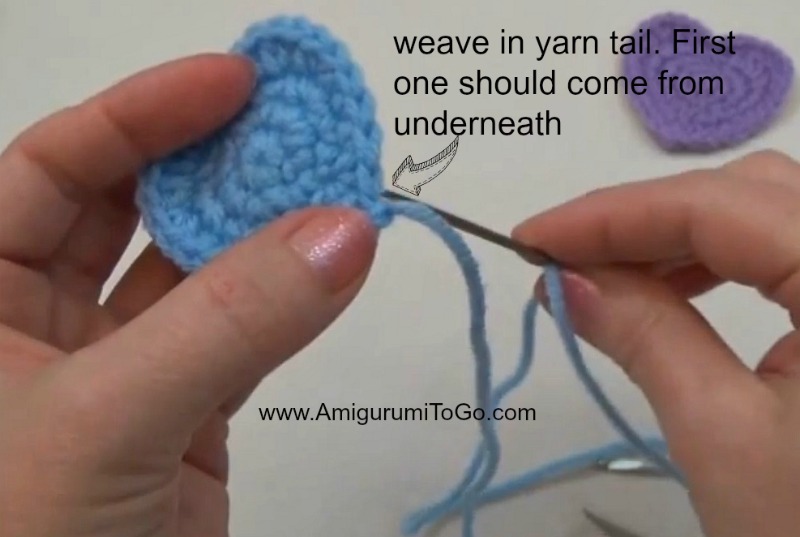 See photo below or view the video tutorial if that stitch is confusing. Also weave in the yarn tail when finished the way I show you and this will take care of that slight dip along the bottom edge of the heart. * To make the heart one row larger continue onto row 5. To keep the heart at this size you will use only 3st of the next row. 1sc in next 2st, sl st and f/o pull tight. Weave the yarn tail in to hide it, see photos below how to weave the yarn tail in to fill out that slight dip along the edge of the heart. 6) (* you will use only 5st of the row) 1sc in the next 2st, 1hdc in next st, sl st next 2st and f/o. Weave in yarn tail to hide it and at the same time fill in the slight dip along the side of the heart. 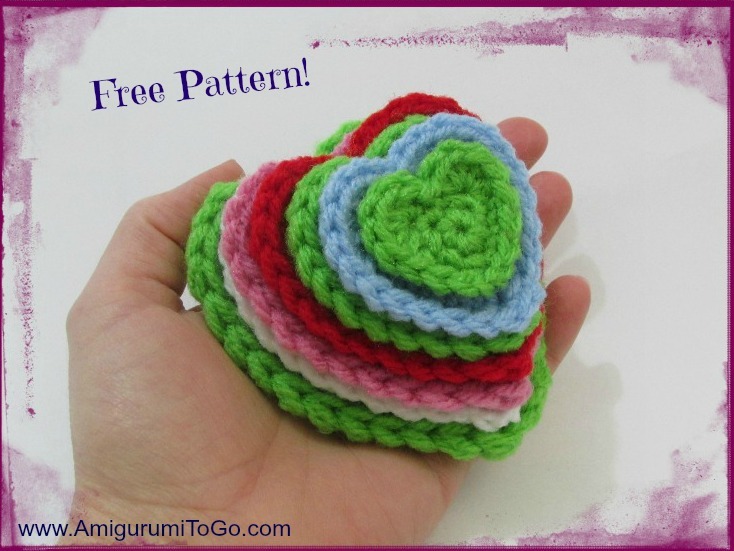 Depending on the size of heart you want, play around with different hook sizes or double up on the yarn strands. Also, pulling in another yarn strand and crocheting it around the back loops makes the heart a row bigger and gives it a pretty outline. I show how to do this in the video tutorial. The 1st one on the ruler I made with 2 strands of yarn and a 5.5mm hook, the 2nd one with a 5.5mm hook and one strand of yarn, the 3rd with a 3.75mm hook and one strand, the last same as the 3rd but finished off one row before. hi sharon, It's very nice. I just worked one up and it's ADORABLE, thanks so much. I collect heart motif patterns and it's so much fun to see how the little differences make each heart unique. 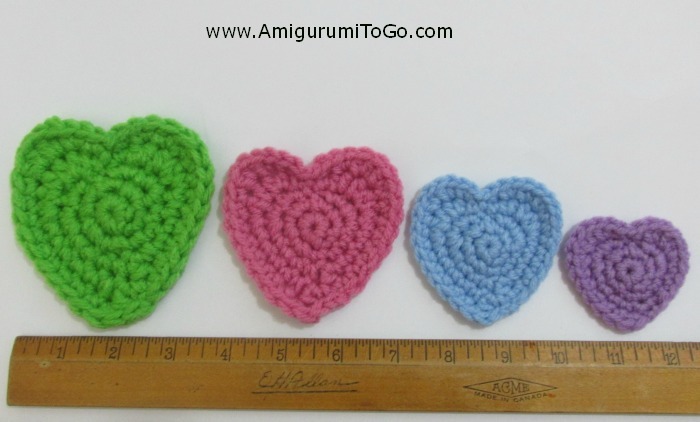 I sometimes sew them onto amigurumi's for babies, the hearts add that little extra love~! wow, I'm so happy to read your message! I really tried to make the pattern different but still user friendly. Heart shapes are actually quite difficult to design, I was surprised! I just wanted to let you know that round 4 has 2 slip stitches here but in your video, it calls for one. It took me a while to figure this out because my stitches kept coming out wrong. I just updated the pattern. Thank you so much for letting me know.